Traveling Sardine Class: Visible Changes . . .
Stoked to go over to the house today to feed the outdoor cats and find really visible changes in the construction project. There has been steady progress this week, but sometimes it's hidden by the clutter, so didn't make for very good pictures. I think the painting was finished on Wednesday but forgot my camera so didn't get these shots of the exterior until Thursday. The trim is done, front and back. The rain gutters are on! 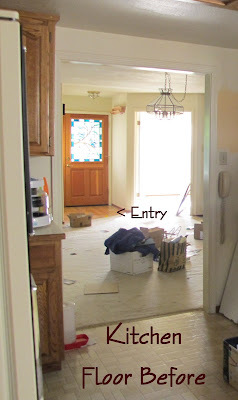 They were closing in on the goal of completing the interior paint on Wednesday. Ceilings are white. Trim is white. All the walls except for the quilt studio (white), kitchen suite and hall bathroom, are the pale gray which I've shown earlier in the new study and my bedroom. There is Yellow Canary in the kitchen suite, here in the little half bath. And Shrimp Boudin in the full bathroom off the hallway. We wonder whether the lighter color on the little partition is really lighter or hasn't been painted or simply looks that way because of the different angle of the light. After a three-cat veterinary visit this week, we are trying Prozac on Jean-Luc to deal with likely behavioral causes of inappropriate urination and to reduce some the hostility between him and Chloe. He's taken it for two days now and I think the dosage is too high. I don't want a zombie kitty, so I'm backing off to restart at a lower dose. This is about as awake and interested as he got this morning as he looked off the cat tree at Henley sniffing catnip on the corrugated scratching post below. (He's so cute!) He eventually got down to look, too. My first clue that today's work on on flooring occurred when I opened the garage door. I'd expected that installation of the rest of the carpeting would have begun, but the roll of carpeting was still there. Missing, however, were the big sheets of some kind of board that I guessed would underlay the vinyl in the bathroom. I decided to enter the house via the deck, instead of walking across newly installed vinyl. I poked my head inside the door and found the love seat on top of the couch! Oh, and the washing machine in the corner. And there was the fridge and dryer on the opposite wall of the living room. Squeal! New flooring in the kitchen suite . . .
And laminate to match the quilting studio's floor in the entryway. 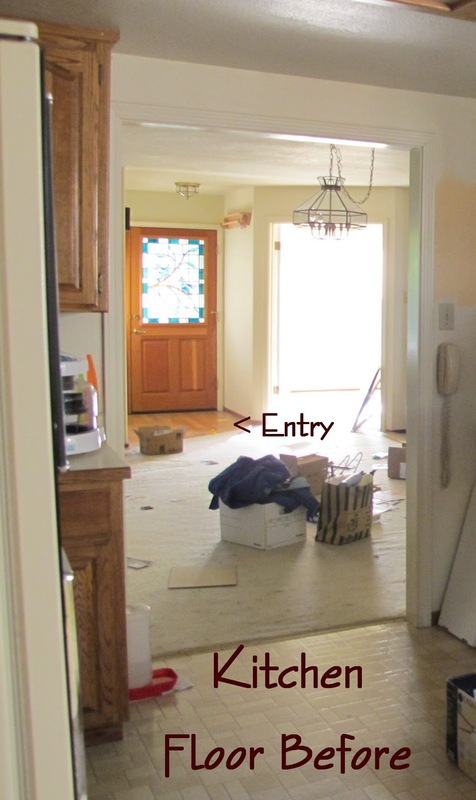 Yes, that's a diagonal line from the end of one wall to the doorway into another room. Carpet to come . . .
Oh, am I pleased to see they took the stove out to do floor under it. But where's the stove? I'd overlooked it here before. I did not take a picture of the hall bathroom. The old carpet is still in place, and a roll of vinyl is in the hall. I look out the window and the propane tank has finally been moved. You can see how close to the side of the house it was in the first picture. Somebody, presumably me, received a stern warning the other day that the tank must be moved. Yeah, really we knew that. They wanted to do it while I was out of the house and wouldn't be inconvenienced by lack of propane and also in conjunction with installing gas lines for relocating a generator I haven't been able to use and for a future new tankless water heater. Yup, missed that stove entirely on my first trip through. Here's the junction where gas lines for the two new uses branch off, . . .
. . . and one comes out the other side of the house for the generator. I'm excited. There's still lots to do, as near as it looks now. Unpacking everything . . . I'm not so excited about that. Getting so close! Isn't it fun to see your appliances all over the house, and knowing you won't be the one putting them back where they belong? When we did the renovation, our fridge moved from room to room--but we were still using it and trying to live in the mess. I hope you get to move back soon, and enjoy your new spaces! Not fond of unpacking, but at least I'll have a place where things will belong.